This strap, highly resistant, attaches to the frame of the bed and quickly and effectively immobilises the wrists of a restless patient, thanks to a velcro system. This model, which attaches to the frame of the bed, has two uses: it is intended to hold both the wrists and ankles thanks to two safety systems (one buckle fastening, the other using velcro). 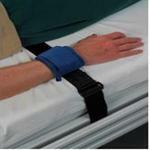 Simple and economic version of the wrist holder, this is aimed more at patients who need to be put on a drip. The wrist is held in place by a velcro system. Another simple and economic version (non-fleeced material) of the wrist holder, this is aimed at patients who need to be put on a drip. It is designed to be used for shorter periods of time. The wrist is held in place by a velcro system.